Revolvers continue to be popular in the age of the autoloader and one that seems to garner good reports far and wide is the Ruger SP101. It is currently offered in .22, .32 Magnum, .38 Special, as well as .357 Magnum. 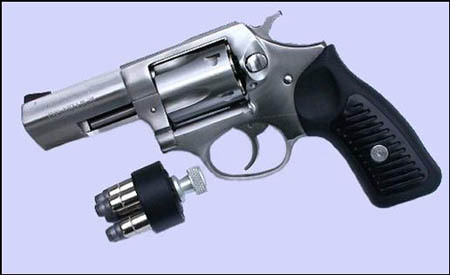 Barrel lengths run from 2 1/4″ to 4″ and the revolver is available with fixed or adjustable sights. The one I purchased was in .357 Magnum with the 3 1/16″ barrel and fixed sights. 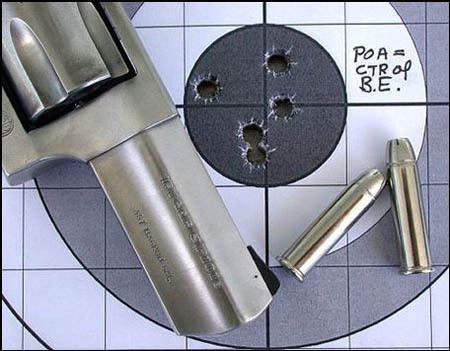 The .357 Magnum chambering is probably the most common and I suspect that it is sold more often than not in the 2 1/4″ barrel length with fixed sights. Of course, .38 Specials can be fired in the .357 guns. These little magnums are five-shooters rather than six and the swing-out cylinder is used. 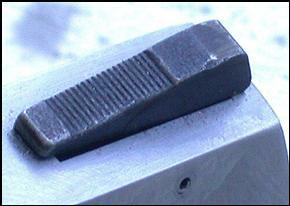 As the gun comes from the factory, stocks are of rubber with plastic inserts snapped in and retained by the grip screw. 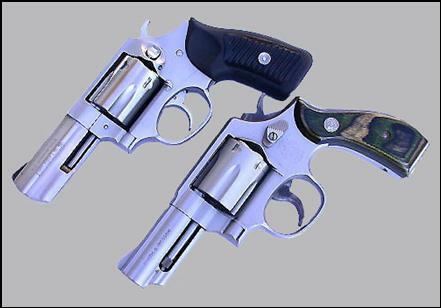 The SP101 is a bit smaller than the S&W K-frame but beefier than the same company’s compact J-frame, some models of which can be had in .357 Magnum. 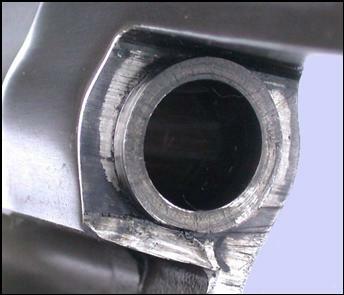 Safety: Internal transfer bar allows for firing only when the trigger is pressed all the way rearward. The revolver is safe to carry fully loaded. Here is the Ruger SP101 compared to the 3″ S&W K-frame Model 65 LadySmith. Both are chambered in .357 Magnum. The slightly larger K-frame holds 6 shots while the Ruger holds 5. Both of these revolvers have shrouded barrels that surround the ejector rods. This S&W is about 5″ tall. Its cylinder width is 1.47″ compared to the Ruger’s 1.349″, but this adds enough to allow for a sixth round. 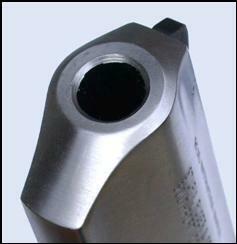 The J-frame cylinder width measures 1.34″ across. The table shows that the SP101 might be thought of as a J-frame on steroids, a compact revolver that has been beefed up in critical areas. Note also that the forcing cone on the SP101 is equivalent to that on the K-frame rather than the J. Having been in constant production in .357 for over a decade now, complaints on the SP101 being fragile have been few and far between. Why is this? The K-frame from S&W has been associated with some parts breakage when a constant diet of magnums have been used, but the K-frame is a bit larger than the SP101. 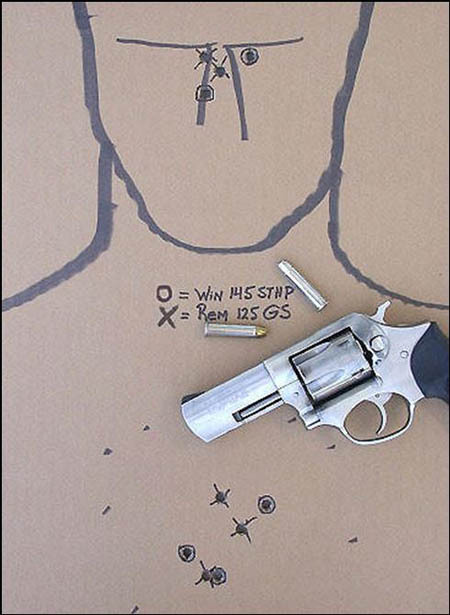 That means there is more steel around the .357’s SAAMI-rated 35K CUP pressure limit each time a round is fired. What’s the deal here? SP101’s are regularly described as being “built like a bank vault” and praised for their ability to digest huge amounts of full-power magnum ammunition. The SP101 is a compact revolver, but its forcing cone is very similar to that of the mid-size S&W K-frame guns. I think the answer is two-fold. It has been my observation that most .357 factory ammunition is simply not loaded as hot as it was a few decades ago. Years ago it was not uncommon to honestly break 1450 ft/sec with various makers’ 125-gr. magnum loads from 4″ barrels. Now, chronographed velocities are closer to 100 ft/sec slower. Since the hot 125-gr seemed the culprit in most cracked forcing cones and flame cutting, this slight reduction in muzzle velocity probably alleviated the problem. Combine with that the reduction in size of .357 Magnum revolvers in recent times. These guns are certainly easier to carry concealed than the K, L, and N-frames of years past, but one pays for it in increased felt recoil. I strongly suspect that most owners of the compact magnum revolvers shoot a few full-power loads through them, but do the bulk of their practice with the considerably milder .38 Special. I believe that this includes SP101 shooters, but they are shooting a gun is probably a bit more rugged than the J-frame. Hence, we get the comments on the Ruger’s durability. I am neither a gunsmith nor a mechanical engineer so I cannot honestly say whether the internal parts on the Ruger are stronger than the S&W, or give bold statements on which system is better. It does appear that both work quite well, but there seems to be fewer complaints of the small Ruger having problems than the small S&W when either is heavily used. 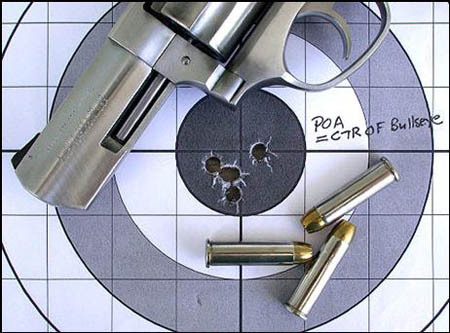 There is an area where the S&W usually beats the Ruger: trigger pull and smoothness of action. I believe that S&W is almost always the winner here. Using full-power springs in the SP101 compared to the S&W will almost always result in a noticeably smoother action in the latter. Both the Ruger and the S&W use coiled springs to power their hammers. The SP101 spring is rated at 14 pounds, the S&W at 8.5. The trigger return spring on the SP comes in at 10 pounds while the rebound spring on the S&W is 18 pounds at factory standard. It seems like the Ruger should have the lighter smoother trigger pull, but such is usually not the case. Some folks reduce the trigger return spring a bit to smooth up the Ruger, but if a person opts to do this, make absolutely sure that the trigger doesn’t have a sluggish return for the next shot. I suspect that S&W perfected the double-action pull many years ago and that we’d have to look long and hard to find better ones on out of the box guns. That does not mean that the RUGER SP101 necessarily has a terrible trigger pull or that they cannot be smoothed up very nicely for they certainly can. The trigger pull on the SP101 used in this evaluation was smooth, but stiff, and certainly nothing special. It has proven imminently useable however. As it came from the box, it did have sharp edges. These were taken care of using 400-grit sandpaper and a little elbow grease. Others have commented on similar experiences and applied similar corrections. Total time spent was less than 15 minutes. Other than that slight “modification”, the SP101 used was as it came from the box. I fired the SP101 at 7 and 15 yards. The revolver was fired in double-action at a combat-type target at the closer distance. At 15 yards, the revolver was fired single-action and from a sitting position with wrists braced. Unfortunately, I only had two types of .357 Magnum ammunition available so I included quite an array of .38 Special also. The chronograph data is based on 10 shots fired approximately 10′ from the chronograph screens. The SP101 used for testing had fixed sights. Nothing fancy to be sure, but they worked fine and provided a very usable sight picture. 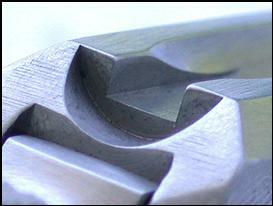 The rear sight notch is very similar to those of other makers’ fixed sight revolvers. The serrated ramp front sight was easy to see in both slow and rapid-fire. It is not likely to snag should the revolver be drawn from concealment. The 130-gr. Remington 38 Special load was exceptionally easy to control from the SP101. These grouped about an inch below POA at 15 yards. Remington’s 158-gr. LSWCHP +P is a favored load in .38 Special. It hit slightly below the POA from the SP101. It was distinctly easy to handle in this revolver. The Remington reduced power 125-gr. Golden Saber in .357 Magnum was easy to control and hit POA almost exactly at 15 yards. The 357 Winchester Silvertip was exactly dead on at 15 yards from this revolver. For me, it was right on the edge of controllability in rapid-fire and especially when shooting with but one hand, but it grouped well and to POA in this slow-fire group. 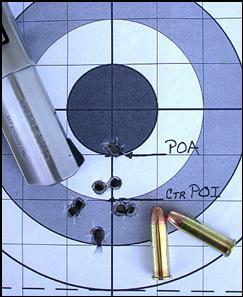 This target was fired upon using Remington 125-gr. Golden Sabers and Winchester 145-gr. 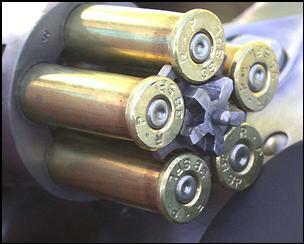 STHP ammunition. 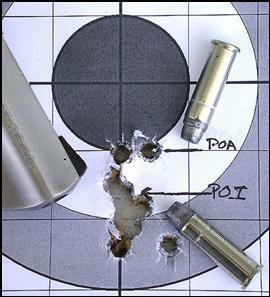 A two-hand hold was employed and firing was done at 7 yards. Shots were fired as quickly as a flash sight picture could be obtained. Though the resulting groups appear quite similar in size, the Remington was distinctly easier to handle; more so than the slight differences in velocities and bullet weights might lead one to believe. On paper, the differences appear pretty slim. In the hand, there is definitely a substantial difference. Neither the double or single-action trigger pulls on my SP101 were as smooth or light as on my J or K-frame S&W revolvers. It is slightly heavier but has smoothed up a bit after roughly 400 shots, about half of which were .357 Magnum handloads and factory ammunition. The gun does appear to have its fixed sights regulated toward the heavier end of the .357 bullet spectrum although POI was perfectly satisfactory at 15 yards with the slightly attenuated Remington Golden Saber load. The 145-gr. Silvertip was right on the edge of becoming uncontrollable in rapid-fire when using two hands. Using one hand, as might occur in a defense scenario, it was not at all easy to handle. For that reason, I will be using the Remington 125-gr. Golden Saber in this gun for now. Other potential defensive .357 ammunition will be looked at as time permits, but the Golden Saber is it for now. I found the revolver more comfortable than expected when firing magnum rounds. No doubt the heavy barrel and its shroud putting more weight up front to reduce muzzle flip were factors, but I think there’s also much to be said for the grips on this revolver. I found them extremely comfortable and have no plans to replace them. There were no malfunctions of any kind. Primer strikes were plenty reliable and well centered. Case ejection was positive and there were no incidents of “sticking” cases. As can be seen in the upper left photograph, the SP101 has a heavy barrel and the long shroud helps reduce muzzle flip. Seen at the right are 5 fired 38 Special cases with the ejector pushed all the way rearward. They lack a tiny fraction of an inch ejecting and falling free. To eject either fired 38 or 357 hulls, one must depress the ejector rod briskly. It sounds harder than it actually is and there were no problems in doing this with 100% reliability. I find the SP101 a little gem. It might be a bit of a “diamond in the rough,” but not by much. I will use this revolver and report back any problems that might crop up. Frankly, I expect none from what I’ve read and now, seen. Some complain about a handgun of this weight for carry. I agree that it is heavier than many revolvers intended for concealed carry. I also find it too large for pocket use, but as a compact belt gun, it is just fine and carries comfortably. Its weight is appreciated when firing magnum ammunition. 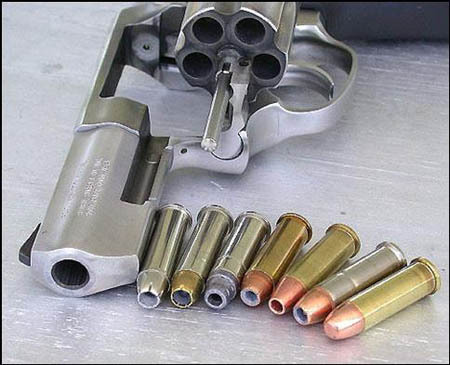 Frankly, I cannot see limiting this revolver to “just” self-protection. Though its stainless steel construction makes it heavier than various lighter framed revolvers, that emphatically does not mean that these are hard to tote. Given a proper belt and decent holster, just the opposite has proven true for me. I think they would be a heck of a fine sidearm for hiking, camping, fishing, or just knocking about in the woods. The gun has no removable side plate. The gun is easily disassembled for cleaning via very good instructions provided in Ruger’s paperwork accompanying the revolver. Some suggest that the frame is stronger as it has no removable side plate as do S&W revolvers. I don’t know if that’s true or not, but do think that these are tough little guns that should easily last a lifetime, even with regular use over the long term. The barrel’s bore cleaned about as easily as a Smith so I assume smoothness is similar. 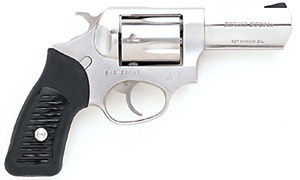 The Ruger SP101 uses the same speed loaders as the J-frame S&W revolvers. For its size and price, I think the SP101 offers a very trustworthy companion whether camping under the stars or walking in an urban jungle. 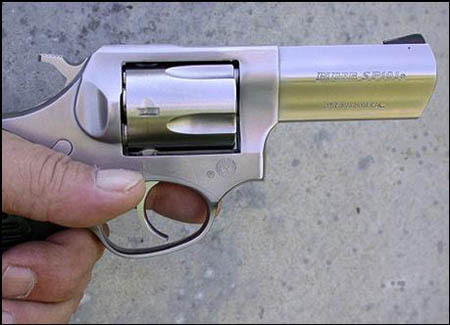 This is a revolver that can stand lots of practice and range time and still keep ticking. You will find no key locks on this revolver. Though I am not about to divest myself of S&W revolvers, neither am I going to ignore Ruger wheelguns. They have a lot going for them and I remain very favorably impressed with this example.